General particulars of the Chandris Liners. The details below was taken from "The Chandris Liners" by William H. Miller. The Chandris Lines cruise ship details. Built by Harland & Wolff Ltd, Belfast, Northern Ireland, in 1952. 16,000 gross tons; 576 feet long; 74 feet wide. Steam turbines, twin screws. Service speed 17 and a half knots. 910 cruise passengers. Built by Federal Shipbuilding & Drydock Company, Kearny, New Jersey, USA, 1944. 24,178 gross tons; 622 feet long; 75 feet wide. Steam turbines, twin screw. Service speed 20 knots. 962 maximum cruise passengers. Built by Newport News Shipbuilding & Drydock Company, Newport News, Virginia, USA, 1940. 34,449 gross tons; 723 feet long; 93 feet wide. Steam turbines, twin screw. Service speed 20 knots. 2,258 maximum tourist class passengers. Built by Swan, Hunter & Wigham Richardson Limited, Newcastle, England, 1951. 6,644 gross tons; 454 feet long; 58 feet wide. Steam turbines, single screw. Service speed 18 knots. 239 cruise passengers. Built by Chantiers de l'Atlantique, St. Nazaire, France, 1951. 16,335 gross tons; 581 feet long; 73 feet wide. Steam turbines, twin screw. Service speed 18 knots. 1,200 cruise passengers. Built by Bethlehem Steel Corporation, Quincy, Massachusetts, USA, 1932. 18,254 gross tons; 638 feet long; 79 feet wide. Steam turbines, twin screw. Service speed 20 knots. 1, 632 all-tourist class passengers. Built by Cammell Laird & Company Ltd, Birkenhead, England. 1930. 5,563 gross tons; 366 feet long; 57 feet wide. Steam turbines, twin screw. Service speed 20 knots. 750 One-class passengers. Built by Barclay, Curle & Company Ltd, Glasgow, Scotland, 1941. 8,418 gross tons; 494 feet long; 64 feet wide. Diesels, twin screw. Service speed 16 knots. Built by John Cockerill Shipyards, Hoboken, Belgium, 1921. 8,178 gross tons; 439 feet long; 57 feet wide. Steam quadrupal expansion engines, twin screw. Service speed 14 knots. 700 one-class passengers. Built by Cammell Laird & Company Ltd, Birkenhead, England, 1931. 5,516 gross tons; 366 feet long; 57 feet wide. Steam turbines, twin screw. Service speed 20 knots. 750 one-class passengers. Built by Bethlehem Steel Corporation, Quincy, Massachusetts, USA, 1932. 18,565 gross tons; 642 feet long; 79 feet wide. Steam turbines, twin screw. Service speed 20 knots. 1,642 all-tourist passengers. Built by Harland & Wolff Ltd, Belfast, Northern Ireland, 1935. 4,595 gross tons; 359 feet long; 52 feet wide. Steam turbines, twin screw. Service speed 20 knots. 426 cruise passengers. Built by Barclay, Curle & Company Ltd, Glasgow, Scotland, 1948. 5,030 gross tons; 399 feet long; 55 feet wide. Doxford Diesel, single screw. Service speed 14 knots. Built by Cammell Laird & Company Ltd, Birkenhead, England, 1946. 3,659 gross tons; 345 feet long; 47 feet wide. Steam turbines, twin screw. Service speed 20 knots. 378 cruise passengers. Built by John Brown & Company Ltd, Clydebank, Scotland, 1950. 5,092 gross tons; 377 feet long; 52 feet wide. Steam turbines, twin screw. Service speed 21 and a half knots. 490 cruise passengers. Built by Cantieri Riuniti dell'Adriatico, Monfalcone, Italy, 1963. 27,907 gross tons; 702 feet long; 94 feet wide. Steam turbines, twin screw. Service speed 24 knots. 1,106 cruise passengers. Built by Harland & Wolff Ltd, Belfast, Northern Ireland, 1950. 18,400 gross tons; 595 feet long; 76 feet wide. Burmeister & Wain diesels, twin screw. Service speed 18 and a half knots. 1,036 passengers. Built by William Cramp & Sons Ship & Engine Building Company, Philadelphia, Pennsylvania, USA, 1927. 20,000 gross tons; 582 feet long; 83 feet wide. Steam turbines, twin screw. Service speed 21 knots. 1,170 maximum passengers. Built by William Denny & Brothers Ltd, Dumbarton, Scotland, 1947. 1,545 gross tons; 251 feet long; 37 feet wide. Diesel, single screw. Service speed 15 knots. 720 passengers. Built by Bethlehem Steel Corporation, Quincy, Massachusetts, USA, 1939. 10,603 gross tons; 493 feet long; 64 feet wide. Steam turbines, twin screw. Service speed 17 and a half knots. 600 cruise passengers. Built by Chantiers de l'Atlantique, St. Nazaire, France, 1939. 32,336 gross tons; 699 feet long; 88 feet wide. Steam turbines, quadruple screw. Service speed 23 knots. 1,122 maximum cruise passengers. Built by Blythswood Shipbuilding Company Ltd, Glasgow, Scotland, 1936. 3,743 gross tons; 326 feet long; 45 feet wide. Steam triple expansion engines, single screw. Service speed 13 and a half knots. 200 cruise passengers. Built by Blohm & Voss Shipbuilders, Hamburg, Germany, 1939, 10,480 gross tons; 487 feet long; 60 feet wide. Diesel, single screw. Service speed 23 knots. 686 cruise passengers. Built by Dubigeon-Normandie SA, Nantes, France, 1971. 14,714 gross tons; 466 feet long; 71 feet wide. Diesels, twin screw. Service speed 23 knots. 686 cruise passengers. Built by Harland & Wolff Ltd, Belfast, Northern Ireland, 1936. 14,917 gross tons; 573 feet long; 71 feet wide. Diesels, twin screw. Service speed 18 knots. 600 cruise passengers. A word from the Author of "The Chandris Liners"
Mr. John Chandris, the London-based chairman of the Chandris Group, took to the podium at the New York's Essex House for an important press conference-"a birth announcement". Ever charming and extremely well-versed in the business of running modern day ocean liners, he is the son of Anthony J. Chandris, one of the genius-like brothers who built up one of the world's best known shipping companies, Greece's Chandris Lines. "The new century will actually begin early, in 1995," he announced enthusiastically. And, indeed, for the Chandris fleet, it did. Through one of it's two cruise divisions, the up-market Celebrity Cruises(the other arm is Fantasy Cruises), the company will then expand and add its largest ship yet, three 70, 000-tonners that have been dubbed "The Century class". The first will enter service in the fall of 1995. At nearly a billion US dollars, Chandris had just signed, together with its new partner in the cruise business, the New York based Overseas Shipping Group, firm contracts with the Meyerwerft shipyards of Germany for at least two 800-foot, 1, 740 passenger luxury ships. The third sistership was considered highly likely at this point. Perhaps to be named Century and Constellation, and with the third name yet to be selected, such a trio would not be amongst the world's largest, but amongst the most innovative and advanced cruise ships. What a high point in the 35-year history of Chandris passenger services! The luncheon that day was served in the appropriately selected Celebrity Grill, a room so reminiscent of the grand era of ocean liners. Chandris is, of course, the perfect subject for a book. They are a fascinating company. I have followed their fortunes and developments almost from the beginning. While an earlier fleet, the Charlton Steam Shipping Company, is included in the history of their passenger ships, it is the Chandris Lines of the late 1950s that Bill Miller remembers. Beginning with the Patris, a Greek-Australian liner service was quite unique in those days. Success followed immediately. More liners, most of them bigger than the Patris, were added and were given some amazing conversions (the transformation of the 760-passenger Lurline into the 1,642 passenger Ellinis, as an example). At the same time, the then separately managed Chandris Cruises took form. While smaller in size, here was yet another fleet of purchases and subsequent conversions.In all, 25 ships are documented in this fleet review, a grand maritime parade of sorts. Some ships occupy special places in mind and memory, I have sailed on Chandris liners on about a dozen occasions. I began in the mid-1960s aboard the venerable Queen Frederica, a 5-day "long weekend" cruise to Bermuda from New York and back, was then priced from $150, or $30 a day! Thereafter, I had other week long cruises out of New York to Bermuda on the brand new Amerikanis, which was certainly one of the most splendidly converted liners of her time; and to Nassau aboard the Ellinis, perhaps best remembered for her very spacious quality. My first Summer trip to Europe in 1971 included 11 days on the little Carina II. It was a terrific adventure: Venice to Dubrovnik, Corfu, Heraklion, Rhodes, Alexandria, Piraeus and a night time passage through the Corinth Canal. A year later, the Regina Magna took us out of Amsterdam to the "Northern Cities" Oslo, Gothenberg, Stockholm, Helsinki, Visby, Copenhagen and London. Soon afterwards, we booked the Regina Magna once again, but this time on a 7 day "Caribbean Capitals" cruise out of Curacao to San Juan, Guadeloupe, Barbados, Grenada and La Guaira. More recent trips have included two sailings in that beloved veteran Britanis, the Meridian to the Caribbean; another visit to the Mediterranean, but onboard the Romanza; and then the gala maiden voyage from New York to Bermuda of the Horizon. What a contrast and, more specifically, what a sense of history between the likes of the stunningly new $200 million Horizon and the likes of the earlier Queen Frederica and Ellinis and Carina II. At the time of writing, and with the forthcoming Century trio, the Chandris-owned cruise fleet includes the Britanis, the Amerikanis, the Meridian and the sisterships Horizon and Zenith. They each wear the distinctive "X", the symbol for the name Chandris, on their blue and white funnels. Together they form one of the world's largest passenger fleet. So many interesting ships! 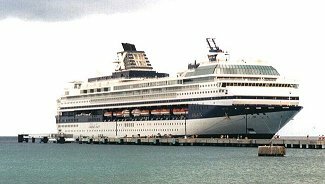 Unquestionably, The current Celebrity Cruises Inc. fleet, which is a joint venture of the Overseas Shipholding Group and Chandris itself, is one of the most fascinating in the annals of passenger shipping. And so, on this exciting occasion, on the ordering of three "mega cruise liners", I offer a heartfelt toast: Congratulations Celebrity Cruises. William H, Miller, Secaucus, New Jersey, USA. The above information was taken from "The Chandris Liners" by William H. Miller. I am indebted to Bill Miller for giving me permission to use some of his personal photos and information [these are subject to copyright]. Once again many thanks to Bill Miller. Home. | Captain and Crew. | History. | Steamboat Bill. | Chandris. | Memorabilia. Mr. Kaparis. | Bill Miller. | The Picture Gallery. | Maritime Links. | Where are they now.